CASF Australia announces that entry to the Corian Design Awards 2018 for Outstanding Design - Edition 3 will close on 30 September. 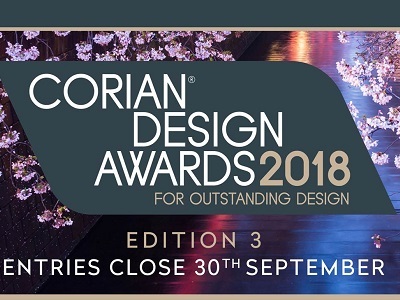 Entries to the Corian Design Awards 2018 for Outstanding Design - Edition 3 can be submitted in two categories – Residential and Commercial. The Corian Design Awards is a year-long program with a competition organised every quarter. At the end of each quarter (March, June, September and December) two winners are announced (one from each category) and shortlisted to go into the end-of-year pool of candidates. An overall winner will be selected in each category by a panel of leading architecture and design professionals in January 2019, with the two winners awarded a trip to Japan. All design practitioners including specifiers, architects, kitchen and bathroom designers, and students are eligible to submit their project for consideration. Please visit the CASF Australia website for more details.